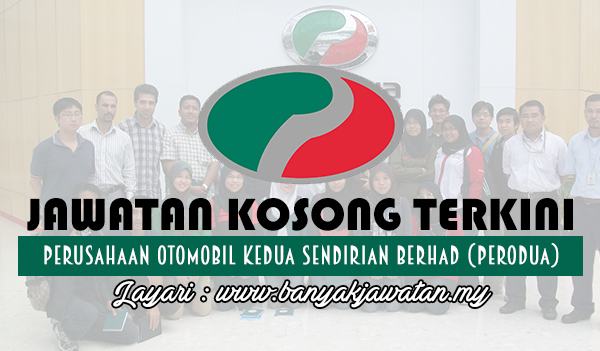 Perusahaan Otomobil Kedua Sdn Bhd, PERODUA (054795V), established in 1993, is a joint venture company between Malaysian and Japanese partners. The shareholders of Perodua are UMW Corporation Sdn Bhd 38%, MBM Resources Berhad 20%, Daihatsu Motor Co. Ltd 20%, PNB Equity Resource Corporation Sdn Berhad 10%, Daihatsu (Malaysia) Sdn Bhd 5%, Mitsui & Co. Ltd 4.2% and Mitsui & Co. (Asia Pacific) Pte Ltd 2.8%. The company started operations in 1994 and the ever so popular Perodua Kancil was introduced to the Malaysian market in August the same year. 0 Response to "Jawatan Kosong di Perusahaan Otomobil Kedua Sendirian Berhad (PERODUA) - 31 Oktober 2018"